The Climate Justice Project (CJP) asks how we can tackle global warming with fairness and equity. Our challenge is to build a zero-carbon society that also enhances our quality of life. This module explores the concept of climate justice, linking global climate change to local actions, and looking at who benefits and who pays the costs from burning fossil fuels. This section also asks students to reflect on their feelings about climate change, which may be dismissive, despairing, angry or hopeful. Climate change is a heavy topic – being able to discuss emotional responses openly and honestly is important. The following CJP publications provide background and deeper context for this module. Links to additional resources, including videos, can be found at the end. Students will review what climate change is, and then develop an understanding of the concept of climate justice. Students will consider who benefits from using fossil fuels and who pays the costs of climate change. Students will consider what climate justice means in the BC context. What are fossil fuels and how do they cause climate change? Is climate change something that will happen far in the future or are we seeing it now? Explain your reasoning. Name some examples of changes in climate or extreme weather. What are some recent extreme weather events that have happened around the world? Global warming: the heating up of the Earth caused primarily by the burning of fossil fuels (oil, coal and natural gas), which releases heat-trapping carbon dioxide into the atmosphere. Climate change: the altering of climate patterns (e.g. more precipitation, more intense storms, floods or droughts) on Earth caused by the burning of fossil fuels. Carbon dioxide (CO2): a heat-trapping molecule, and the principal greenhouse gas of concern to climate scientists. A growing concentration of CO2 from burning fossil fuels is warming the Earth. 2°C: the amount of global warming above pre-industrial levels (200 years ago), which could lead to catastrophic outcomes for human populations (and countless other animal and plant species). The Earth has already warmed by 0.8°C above pre-industrial levels. Ask students to write or draw any thoughts, feelings, questions or ideas that stand out to them from the slideshow. Allow time for students to write both during and after the slideshow. Ask students to share their thoughts with a partner, then debrief as a class. Discuss: How might climate change affect people in different circumstances differently? READ ALOUD: Climate justice means recognizing that climate change has negative effects on most people in the world, but impacts the poor and vulnerable the most – those who have done the least to contribute to the problem. Climate justice says that we in wealthy countries – and the wealthier among us – who have benefitted the most from using fossil fuels, must do more of the heavy lifting to reduce our greenhouse gas (or carbon) emissions. As well, actions to address climate change and reduce our greenhouse gas emissions must be implemented in a way that is fair and just. Let students know this video was created by the Canadian Youth Climate Coalition, which is made up of young people like them! Which countries have benefitted the most from using fossil fuels? Are these the same countries that will be most impacted by climate change? What are some examples of places and populations that are the most vulnerable to climate change? Does BC or Canada have a moral obligation to reduce our emissions, or should we only be concerned with our own economic interests? Why? READ ALOUD: In BC, most people seem to understand that the concrete effects of climate change are already upon us, with profound consequences for our economy, society and environment. To rise to the challenge of climate change, our province needs to dramatically reduce its greenhouse gas (GHG) emissions. The good news: BC has legislated greenhouse gas reduction targets (30% below 2007 levels by 2020, and 80% by 2050), and brought in a modest tax on carbon. The bad news: BC has no concrete plan to fully achieve its legislated greenhouse gas reduction targets. Instead, the province’s economic focus has shifted to ramping up the extraction and export of fossil fuels – in particular, natural gas in the form of liquefied natural gas (LNG) as well as coal. Companies are also seeking to build pipelines across BC from Alberta’s tar sands (which yield a substance called bitumen that can be refined into oil) to the coast. Does it make sense for BC to try to reduce its GHG emissions while at the same time expanding exports of fossil fuels? Why or why not? Should BC aspire to be a leader in reducing its emissions or wait for others to act first? Why? What are some things we could do in our city or province that would reduce our GHG emissions? SHOW POWERPOINT SLIDE: “BC greenhouse gas emissions per person” in the Introduction to Climate Justice PowerPoint. Explain graphic: A quintile is one-fifth of households. In this graph, quintiles are ranked from lowest income (i.e. the bottom 20% of households) to highest income (i.e. the top 20%). Just as we saw at the global level, there are differences within BC in terms of who benefits most from using fossil fuels. 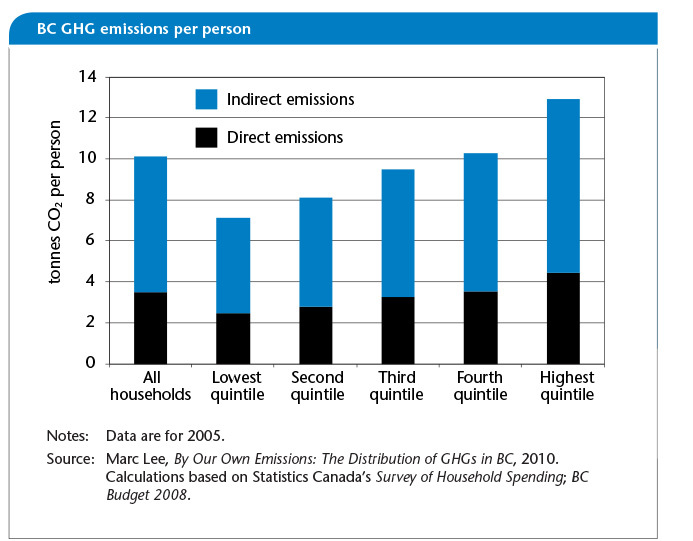 The higher a person’s income, the more GHGs they tend to emit. ACTIVITY: In pairs or small groups, discuss the following questions, then debrief as a class. Why might people with higher incomes be responsible for more emissions? Possible responses: increased ability to consume products and use resources; personal benefits that come with using energy or burning carbon, e.g. access to cars, planes, etc. What are other reasons why some people may have higher emissions than others? What are some barriers people face in reducing their emissions? Possible responses: they may not be able to change the fuel used for home heating (e.g. rentals, multi-family housing, unaffordable); they may live in an area without public transit alternatives; they may need a vehicle for work, etc. 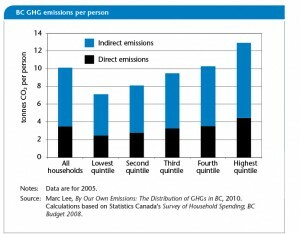 If British Columbians need to reduce their GHG emissions, should some people reduce theirs more than others? Why or why not? Possible considerations: low income households already have lower emissions so wealthier households should do more; transition may be easier for people in urban areas than for those in rural areas; children, seniors or people with disabilities will likely have challenges in areas like transportation. ACTIVITY: As a class, brainstorm and mind map on the board: What are some things we can do as a province to pursue climate justice in BC? BC has one of the highest poverty rates in Canada. How might the pursuit of climate action help or hinder action to address this important issue for our province? A commitment to climate justice is a way to ensure fairness for young people today and into the future, both here in BC and around the world. Climate change is a big global problem, but there are lots of solutions. The key is getting people to work together to make change. Climate action is often local. Young people in BC are concerned about climate change and are already advocating for climate justice. A couple of examples are below. What can you do to help make a difference? Kids for Climate Action is a Vancouver-based youth group advocating stronger political action on climate change, founded in 2010 to organize a rally prior to the UN Climate Change Summit in Cancun. Since then, K4CA has organized bike rides, rallies, marches, petitions, letter writing campaigns, elementary school presentations, volunteer canvassing, and most recently, a campaign during the 2013 BC election and a campaign against coal export expansion. During the election campaign, high school students engaged in door knocking in key neighbourhoods, distributed almost 200 “I’m voting for climate action!” lawn signs, and fundraised and bought advertising in key transit hubs around Metro Vancouver with similar messages. Youth For Climate Justice Now is a group of Vancouver youth who organize events such as the Vancouver Earth Day Parade, and an annual Climate Change Conference held at Windermere Secondary. Their goal is to give students a real life opportunity to explore, improve and use their individual and combined agency to make their schools and communities more environmentally just. Their goals involve exploring ideas and planning events that seek to mentor, educate and unite youth in common cause.